﻿Two weeks back we had friends for dinner, she is from Vietnam and he is from Belgium and they have been married for a while and have a teenage daughter. 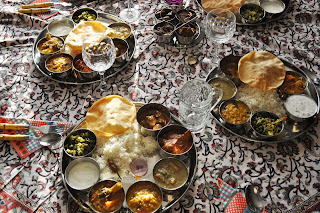 When ever we ask them I make India food as both of them live Indian food and this time when we invited them I decided I will do a thali dinner, which to our delight they loved it, especially when I brought the tali plate filled with various kind of dishes and she really love papadoms. So when they came home they gave me a gift packet and to my delight it was a baking book, I was really pleased about getting a baking book as a gift. And two days later I made these super delicious Caramel Bars and took a whole bunch to our friends place as she loves sweets . I must say if you make this, share with your friends etc....as it is a rich bar. 120 gm butter, plus extra for the pan. Prepare the tin ( 23 x 23 cm) I rubbed with a bit of butter and then used baking paper and overflowed the paper a bit so that it will be easier to take it out from the tin. I didn't had the above measurment pan so I used my tin which I use for making brwonies. 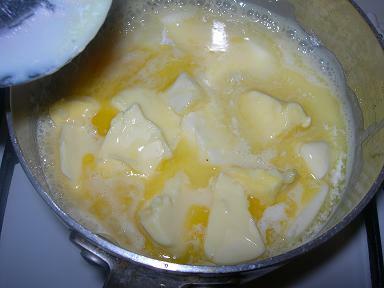 Mix the butter, flou and sugar in a food processor till it gets to a ball. Take this ball mixure and spread into the pan. Bake this for 20 to 25 minutes, till the top is golden brown. In the mean time make the filling. 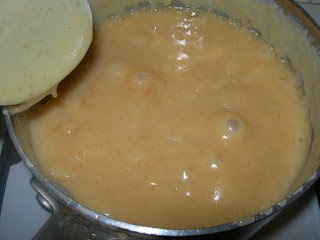 Heat a pan in a low fire add the butter, sugar , syrup and the condensed milk and heat it till teh sugar is dissilved. Then highter the heat and bring the whol mixture to boil, loved the heat and simmer for 8 to 10 minutes, till it is thick. 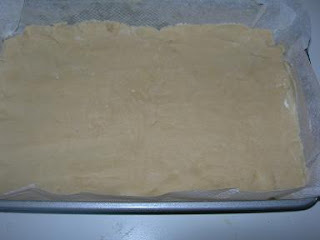 Pour this mixture to the baked dough ( the baked dough should be cold) and let it get hard by keeping it in the fridge. This will take 2 hours or more. 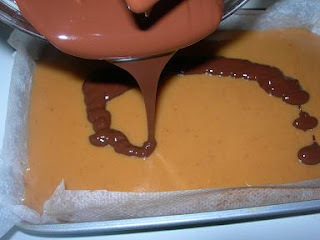 For the chocolate layer, melt chocolate in a MW and pour over the hardened layer of caramel and leave thie chocolate to get hard in the fridge. 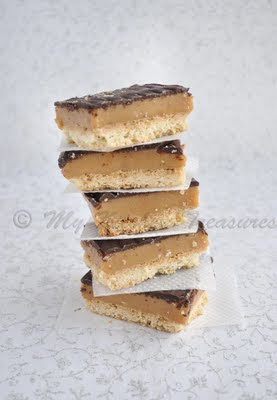 When you want to slice into bars, just lift everything using the baking paper and slice them according to the size you like. 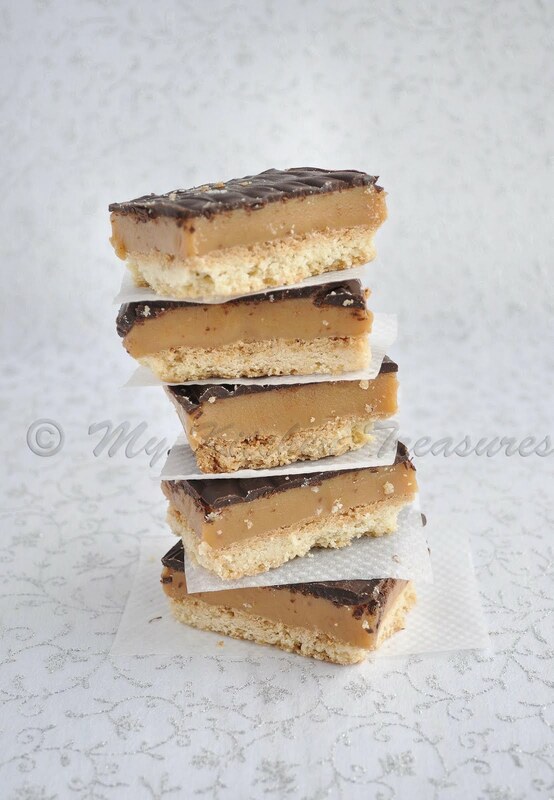 Omg, seriously am craving for some caramel bars, looks marvellous and quite addictive..
Wow,sounds so awesome! 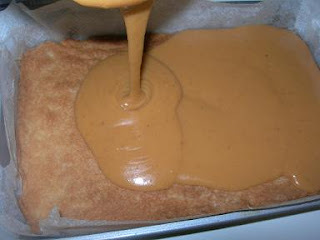 I love caramel very much,with chocolate,its double treat! Rich and yummy! Can't go wrong with chocolate and caramel! That thali dinner looks fantastic. I am curious. What were the individual dishes? This bar is very tempting that too this early in the morning. 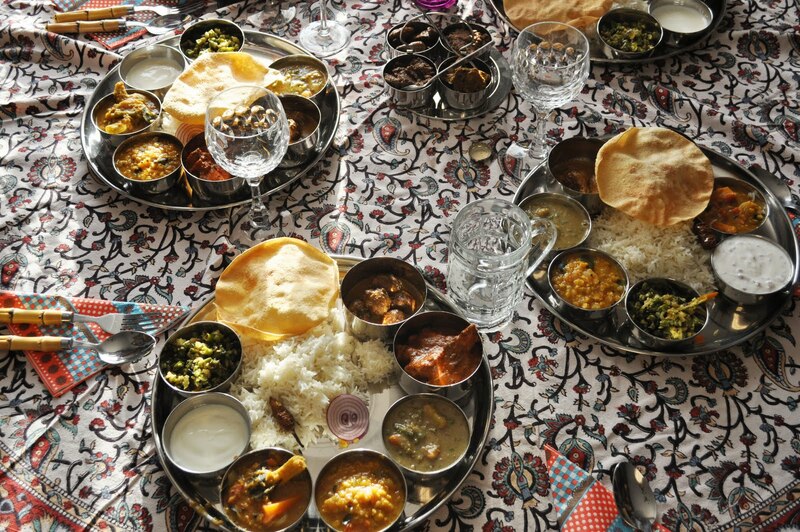 Thali dinner is such a nice idea to treat guests, i am planning to get the proper ware when i go home next time. Nice pictures as always ! That thali looks fabulous.. your friends must've been bowled over for sure. 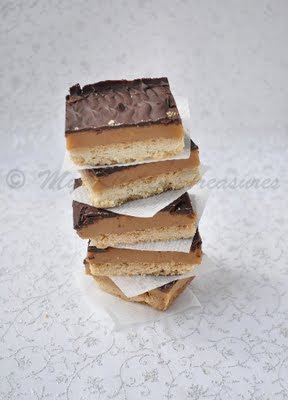 As for those bars - simply divine... chocolate & caramel together - perfect! the layering looks soo good!...pass me a few! Deliciously inviting carame bars. Lovely preparation. 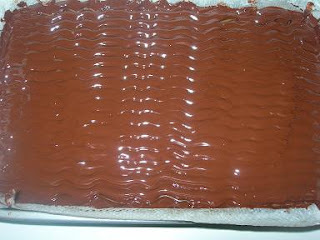 I love the waves in the chocolate, last photo. i'm thinking it's a good omen that i saw caramel - it means the caramel custard i'm fancying now will be good if i make it soon. too many eggs in the fridge. Ur guest should be delighted. U really managed to cook so many items,great! Your thali looks absolutely amazingly perfect! 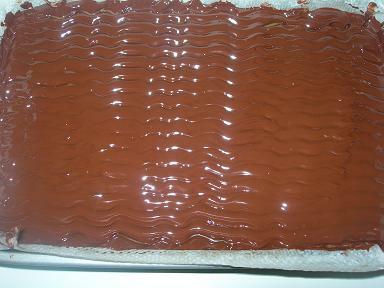 And what a perfect end with the chocolate caramel bars! Lucky guests!